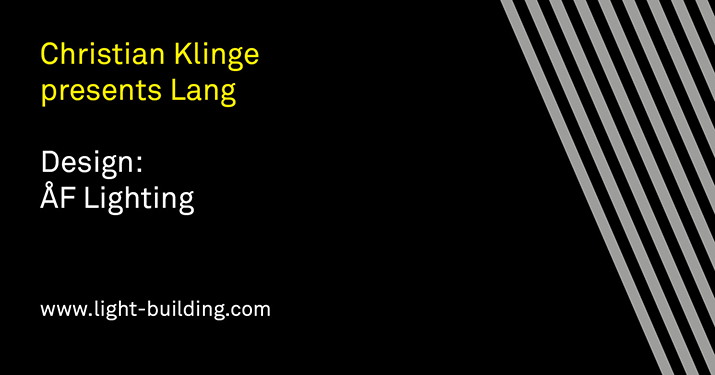 On Monday the 19th of March at 13.00 during Light+Building 2018 in Frankfurt at our stand (A40, Hall 5.0), Christian Klinge, Head of Innovation - ÅF Architecture & Design, will introduce ‘Lang', the new post top luminaire that ÅF Lighting has designed for Neri SpA. This is a great opportunity to hear directly from the voice of the people behind it, the innovative features that this new product will be equipped with. Lang reflects the Scandinavian design principles of simplicity, balance and quality, with a twist, called the blade. Light is not only a need, it creates a sense of place and identity whilst offering memorable experiences and defining the space that surrounds us. Lang’s blade is a highly customisable tool able to change the appearance of the luminaire and to tell stories through shades. ÅF Lighting is at the forefront of the professional lighting design business. With thirty years of experience, and many award-winning projects, it’s currently one of the largest lighting design offices in the world.